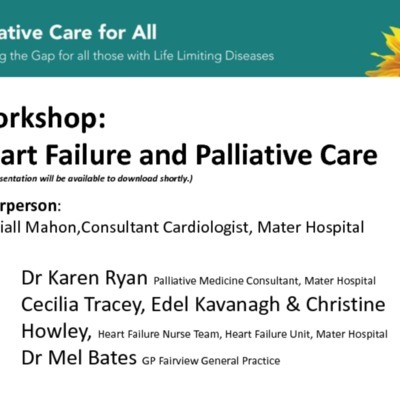 On Heart failure and palliative care. 3. Presentation by Bettina Korn, Respiratory CNS & End of Life Care Co-ordinator, St James’s Hospital, Kaye Kealy, CNM, Community Palliative Care, Our Lady’s Hospice and Care Services titled 'Interview with patient who has benefitted from the work of the action research project' . 1. 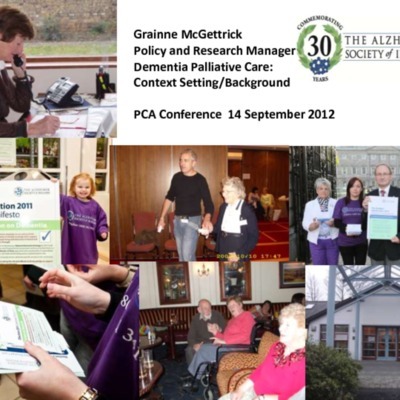 Grainne McGettrick, Michele Hardiman, Cecelia Hayden, and Muriel Parke 2.Dr Karen Ryan, Christine Howley, Edel Kavanagh, Cecelia Tracey and Dr Mel Bates 3. 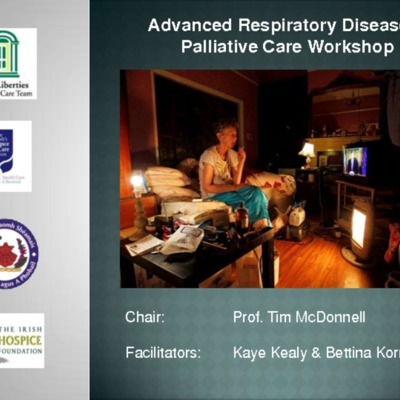 Bettina Korn and Kaye Kealy , “Workshop presentations : 'Bridging the Gap' conference September 2012 ,” Archives Hospice Foundation, accessed April 21, 2019, http://archives.hospicefoundation.ie/document/2013.